In addition to “strange,” the NYT described this view as “ridiculous,” “silly,” and “absurd” (methinks the Old Gray Lady doth protest too much). Perhaps this will help. Let’s survey some other “silly” people who have embraced this heretical understanding of our liberties. And what country can preserve its liberties, if its rulers are not warned from time to time that this people preserve the spirit of resistance? Let them take arms. . . . 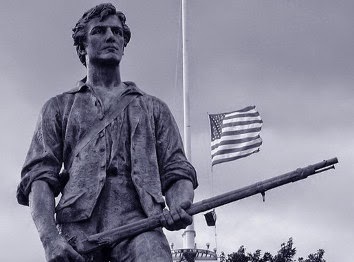 But if circumstances should at any time oblige the government to form an army of any magnitude, that army can never be formidable to the liberties of the people, while there is a large body of citizens, little if at all inferior to them in discipline and use of arms, who stand ready to defend their rights. . . . The only refuge left for those who prophesy the downfall of the State governments is the visionary supposition that the federal government may previously accumulate a military force for the projects of ambition. The reasonings contained in these papers must have been employed to little purpose indeed, if it could be necessary now to disprove the reality of this danger. That the people and the States should, for a sufficient period of time, elect an uninterrupted succession of men ready to betray both; that the traitors should, throughout this period, uniformly and systematically pursue some fixed plan for the extension of the military establishment; that the governments and the people of the States should silently and patiently behold the gathering storm, and continue to supply the materials, until it should be prepared to burst on their own heads, must appear to every one more like the incoherent dreams of a delirious jealousy, or the misjudged exaggerations of a counterfeit zeal, than like the sober apprehensions of genuine patriotism. Extravagant as the supposition is, let it however be made. Let a regular army, fully equal to the resources of the country, be formed; and let it be entirely at the devotion of the federal government; still it would not be going too far to say, that the State governments, with the people on their side, would be able to repel the danger. The highest number to which, according to the best computation, a standing army can be carried in any country, does not exceed one hundredth part of the whole number of souls; or one twenty-fifth part of the number able to bear arms. This proportion would not yield, in the United States, an army of more than twenty-five or thirty thousand men. Will Hillary Get the Petraeus Treatment? WHO KNEW? Elizabeth Warren is Pro-Life!